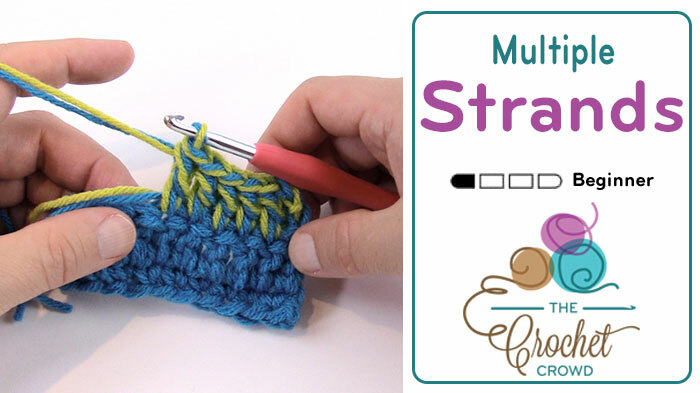 Doubling or more yarn strands can significantly change your crochet for a number of positive features. Let me share some interesting facts about this particular crochet topic. Adding More Yarn Strands with Thicken Project. It will make the project heavier in weight. It will make the project bigger because yarn gauge has been changed by more strands being added. You will go through more yarn to compensate for using multiple strands. Afghans in double strand will use twice as much yarn. Triple Strands will use 3 times more yarn and so on. Doubling or adding more yarn doesn’t ensure the project will look the same in the end. With multiple yarn strands, the stitches can appear bigger and not as refined in appearance. That is a personal choice and is completely up to you. When I was a teenager, I couldn’t afford yarn. So I asked family to see if they had left over yarn that I could use to make my afghan. I was a really skinny kid and got cold fast here in Ontario, Canada. So I decided on my own whim to try and double up my yarn when using to make my afghans heavier. I wanted something thick and solid. I wish I had a picture of my afghan that I did with this technique, I was pretty proud of it. Over the years, I have doubled up my yarn and I realized back in 2001, when the Vibrant Catherine Stitch Wheel Afghan was made that I could double up my yarn but be strategic about my colour transitions. Between you and I, I did this afghan in the transition of separating from my wife and beginning a new life after coming out of the closet. It was my therapy afghan making at the time. I still have this afghan today and is really popular in the shows when I bring it for display. For me, it’s my emotional connective blanket and has a dear place in my heart. Jeanne has done the same in her latest afghan of doubling up on yarn and transitioning through the colour way using the same technique. Look at her stitches below and you can see the colour transitions of when she was using a mix of the two different colours verses when she was using two strands of the same colour for the solids. Her afghan is the Sweet Memories Afghan.